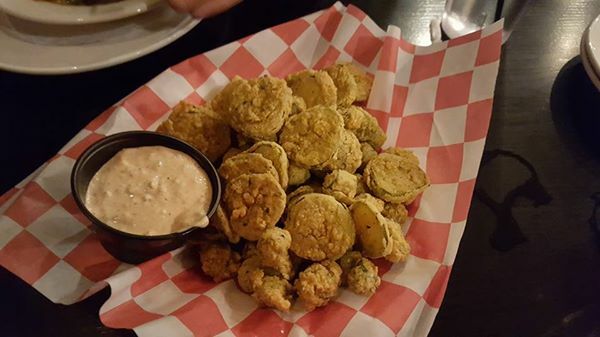 The pickle chips and okra appetizer combo. Only $5.95 and so big we couldn’t finish. I walked out of Black Eyed Sally’s very sad—sad that we didn’t find this place sooner. I’ve been to Texas twice in my travels, to Dallas and San Antonio. Add up all the meals I had in those two cities, and while I did indeed have great BBQ down there, I think what I had here may have topped it all. The building actually reminded me of something you might see in New Orleans. The theme is Cajun and soul food. The walls are colorful, almost loud with decoration. It felt like a N’awlins blues or jazz club. The bar is hip. The service was also outstanding. It’s a place Anthony Bourdain would eat at. If there was ever a reason to bring me back to Connecticut, it would be this restaurant above all else to get the job done. Being the last night of the trip, we loaded up on appetizers, including gumbo, the pickle chips and fried okra combo, and fried green tomatoes. The gumbo was smoky and delicious. The others were incredibly fresh. 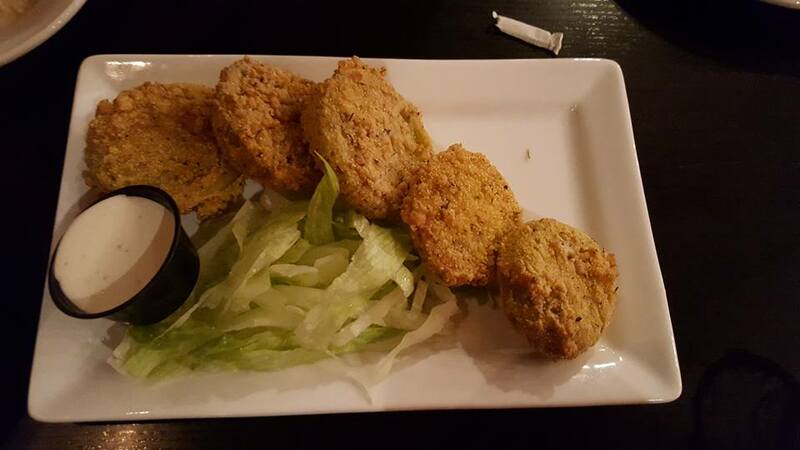 These weren’t sitting in a bin for hours, but fried to order. The breading was light, containing various herbs and spices, and the overall product was crisp, not soggy or greasy. This was the first time I ever had green tomatoes. They were tender, almost creamy on the inside. This was washed down with a pint of Yuengling, though I was kicking myself that I wasn’t more adventurous in tackling their mammoth beer menu. 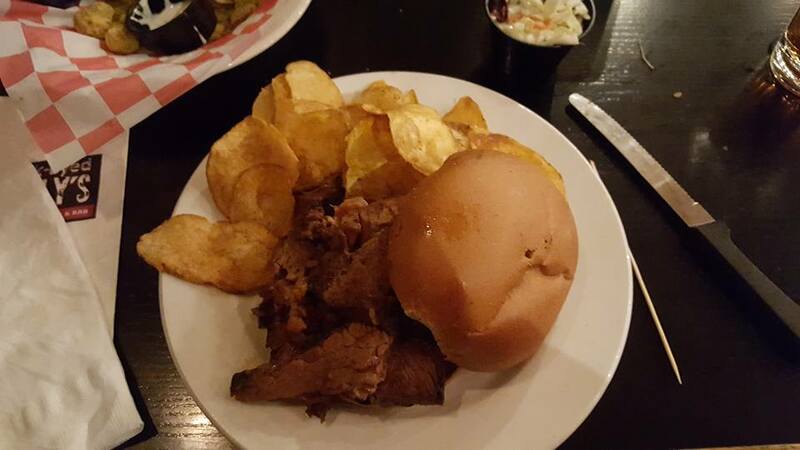 The main course was a BBQ favorite of mine: the brisket sandwich. This was second only to my mother’s, and the best I have ever had in a restaurant. Ever. There was a fair amount of 16-hour-smoked beef piled high on a bun and served dry. This is very important to me. Restaurants tend to smother everything in sauce, either because they think they have the best or because they want to hide an inferior or dry product. This meat was lean, tender, and juicy. The only way I could describe it would be the flavor literally bursting in my mouth. The picture here on this blog does not do it justice. Meanwhile, my friend ordered the chicken po’ boy and admitted to me that he was already full when it came, but had to force it down because of how great it was. Both came with homemade potato chips. By the end of the meal, both of our plates were doused in the house BBQ sauce which was on the table. It was tangy, just a little bit sweet, and not too smoky—it worked well with the flavors at hand. I would have bought a bottle. One last thing I want to mention is the service. Our waitress, Carrie, was attentive, funny, and super nice. It was great chatting with her about the restaurant’s history and what spices may or may not be in the dry rub seasoning. We came in a little after 7 p.m, not realizing it was a Sunday (it’s easy to lose track of days while on vacation) and the restaurant was closing at 8 p.m. At no time were we rushed. Like I said before, this definitely would have been worthy of multiple visits if we knew about it sooner. We would go back just to see Carrie. She made us feel at home. There were so many items on the menu I would like to try, including the cheesy grits and one of the smoked meat samplers. Maybe another time. For now, I will give this an extremely rare 4.5 out of 5 stars. Bravo! This review was originally posted here. Black Eyed Sally’s is located at 350 Asylum Street in Hartford, Connecticut.